The World Map (ワールドマップ, Wārudo Mappu? ), also known as the Overworld, plays a prominent role in many games of the Final Fantasy series. It is a smaller-scale representation that is used in the game to make travel less time-consuming and easier for the player. On it, the player can move about between various locations including towns, dungeons, and other areas, as well as fight monsters in random encounters. 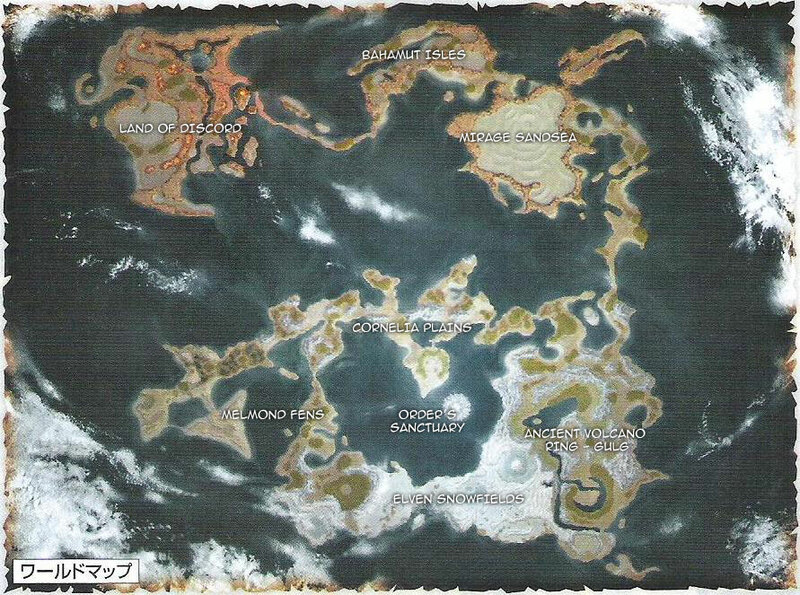 Later games, including Final Fantasy X, Final Fantasy XI, Final Fantasy XII, and Final Fantasy XIII, did away with an explorable World Map and replaced it with groups of large, fully-scaled, interconnected areas. The game offers various modes of transportation to the player. In most games, the player is initially forced to walk to each location. But, more modes of transportation become available as the game progresses and the player is required to overcome geological obstacles. These modes include boats, airships, hovercrafts, chocobos, etc. vels around the World Map, with the exception being Final Fantasy VIII. Certain games in the series, especially Final Fantasy IV, have more than one overworld theme, because there is more than one overworld map.